A commander from the Russian Caucasus known as Abu Omar al Chechen is a key leader in the Muhajireen Brigade, a jihadist group that fights alongside the Al Nusrah Front for the People of the Levant against the regime of President Bashir al Assad. The Muhajireen Brigade, whose members include fighters from the Islamic Caucasus Emirate, has played a vital role in overrunning several major Syrian military installations over the past year.Abu Omar "is an Emir of Mujahideen Brigade of Muhajirs, or migrants ... which also includes volunteers from the Caucasus Emirate," according to Kavkaz Center, a media arm of the al Qaeda-linked Islamic Caucasus Emirate. 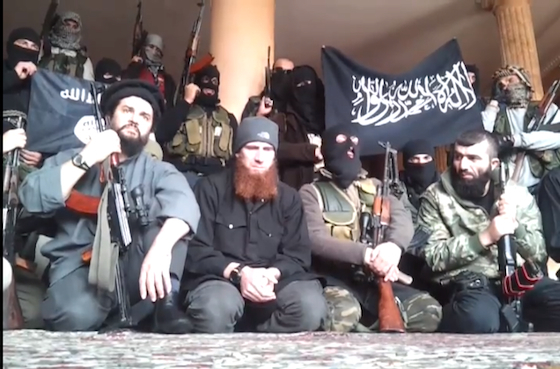 Kavkaz Center posted a video of an appeal by Abu Omar on its English-language website on Feb. 7.In the video, Abu Omar, sporting a red beard and what appears to be a North Face cap, is seen seated among 19 heavily armed jihadists, many of whom are masked. Two of the jihadists are seen holding al Qaeda in Iraq's flag. The Al Nusrah Front, with which the Muhajireen Brigade is closely allied, is al Qaeda in Iraq's affiliate in Syria, according to the US government [see LWJ report, US adds Al Nusrah Front, 2 leaders to terrorism list].According to Kavkaz Center, the Muhajireen Brigade "is one of the most active units of Mujahideen fighting in Syria against the Alawite regime of Assad and Iranian mercenaries rafidites [those who reject Islam]. ""Chechen fighters," often described as fighters from the Caucasus and southern Russia, have been spotted on the Syrian battlefield for months. In October, a group of "Chechen emigrants" is known to have fought, along with an element from the Free Syrian Army unit, under the command of the Al Nusrah Front to take control of a key Syrian air defense and Scud missile base in Aleppo. The Long war Journal speculated at the time that the group included members of the Islamic Caucasus Emirate [see LWJ report, Al Nusrah Front commanded Free Syrian Army unit, 'Chechen emigrants,' in assault on Syrian air defense base].The Muhajireen Group is known to have participated in two other major assaults against Syrian military bases since the October operation in Aleppo.In mid-December, the Muhajireen Group teamed up with the Al Nusrah Front to overrun the Sheikh Suleiman base, or Base 111. Arab and Central Asian fighters are reported to have participated in the battle.And last week, the Al Nusrah Front, together with the Tawhid Brigade and the Muhajireen Group, stormed the base of the Syrian military's 80th Regiment (or Brigade), which is situated near the main airport in Aleppo in eastern Syria. Doku Umarov, the emir of the Islamic Caucasus Emirate, has praised the "mujahideen" in Syria as well as the fighters from the Caucasus. In November, Umarov released a speech on the Kavkaz Center website that addressed the jihad in Syria. "I appeal to the brothers, and I want to stress that we, the Mujahideen of the Caucasus, pray for you, make Dua [supplication to Allah], ask Allah to help you with His angels, that Allah helps you in every way,' he said.In the speech, Umarov warned the Syrian jihadists not to "replace the regime of Bashar al-Assad, using Turkish, or Saudi, or Egyptian, or American, or English money, with another idol under the guise of democracy. "Umarov was added to the US's list of Specially Designated Global Terrorists in June 2010. The US added the Islamic Caucasus Emirate to the list of Foreign Terrorist Organizations in May 2011. Read.. Kavkaz Center Has Turned Up in Sweden http://www.kommersant.com/p-3204/r_500/Kavkaz_Center_Has_Turned_Up_in_Sweden_/ kavkaz center presence in Lithuania is of course telling,since they dont figth the zionist ran govt there,yet use it as a base to demand jihad against Russia!